Over sized cape with 4-5 bedrooms. One bedroom on main fl.has built ins for desk/office space. Large family room off the dining room, more built ins! Wood burning fireplace in livingroom for those cozy evenings. Bedrooms up have built in closet/drawer spaces. Large full bath on main floor, laundry main floor. Enjoy the screen porch in back or hang out on the deck to the private yard area! Maine Endwell Senior High School High School / Public 8 1.03 mi. African Road Elementary School * Elementary School / Public 9 1.9 mi. George F Johnson Elementary School * Elementary School / Public 4 1.73 mi. Homer Brink School * Elementary School / Public 5 0.28 mi. Maine Endwell Middle School * Middle School / Public 7 1.48 mi. Vestal Middle School * Middle School / Public 7 1.9 mi. 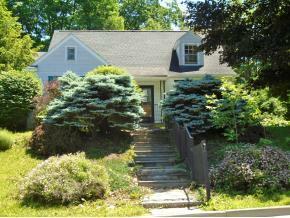 406 Corey Avenue, Endwell, NY 13760 is a 5 bedroom, 2 bath single family home was sold for $95,000.